​some of its earliest days. The 2014 Program, click the image above to view or download. 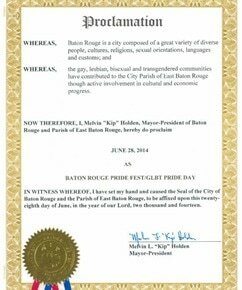 Baton Rouge/East Baton Rouge Parish Mayor-President Kip Holden recently signed a proclamation declaring June 28, 2014, as LGBT Pride Day in the city-parish. The mayor’s proclamation: “Whereas Baton Rouge is a city composed of a great variety of diverse people, cultures, religions, sexual orientations, languages and customs, and whereas the gay, lesbian, bisexual and transgendered communities have contributed to the City-Parish of Baton Rouge/East Baton Rouge through active involvement in cultural and economic progress, now, therefore, I, Melvin 'Kip' Holden, Mayor-President of Baton Rouge and the Parish of East Baton Rouge, hereby do proclaim June 28, 2014, as LGBT Pride Day.